The last word in dedicated wedding planning. 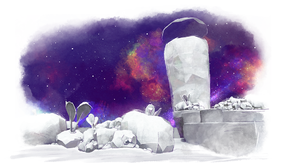 The Dark Side of the Moon is a secret kingdom in Super Mario Odyssey, and is the greater location of Rabbit Ridge. It is served as the sixteenth kingdom overall in the game. It is reachable once the main game is completed and 250 Power Moons have been obtained. Rabbit Ridge is the home of the Broodals, and is ruled over by Madame Broode. Due to her love of vegetables, many statues of vegetables can be found scattered around the kingdom, primarily turnips. The largest one, however, is a carrot statue known as Rabbit Ridge Tower. In Rabbit Ridge Tower, the Broodals challenge Mario to a rematch. 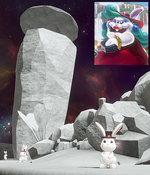 Outside the tower, many generic rabbits wearing top hats can be found; they can be neither spoken with nor captured. 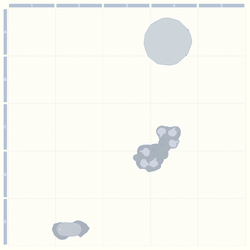 No regional coins exist in this kingdom, and as with the Moon Kingdom and Darker Side, Mario experiences lighter gravity except while in the bonus areas. Sadly inedible tower & similarly inedible owner. This ostentatious stone tower was carved at the direction of the vegetable-loving Madame Broode, who lords over Rabbit Ridge. Her underlings, the Broodals, live within and always have a warm "welcome" for visitors. Responsible for client relations on behalf of the Broodals' wedding-planning firm, Topper is usually found on-site, troubleshooting. You can tell how serious he is about a battle by the number of hats he has stacked on his head: he doesn't tap into his full hat reserves except for the most dangerous opponents. So if you square off with him and he seems to be mostly hat, you should feel honored...and afraid. Best hat-handler on the team. He's not the most focused, but Rango is a valuable player on the Broodals team, always coming through in the end. A master of his boomeranging trampoline hat, he can throw it both straight and curved with almost unnatural control over the way it flies. On the other hand, he sometimes zones out a bit and looks confused. That's your chance to counterattack! It's best not to get her mad. The least predictable of the Broodals, Hariet is most often found throwing bombs with her hair. When her homemade bombs explode, they leave a pool of fire on the ground, so try knocking them away before they explode. While it may seem reckless to have filled her hat with bombs, Hariet is devious and keeps a lot of spare explosives with her, so watch out! Is the vulgarity all an act? Spinning around while spitting poison in a wide area, Spewart is the least subtle of the Broodals. But he also has an unexpectedly artistic side, as his poisonous ground-paintings show. Watch out for the moon's light gravity; you can still die falling off a cliff. Investigate behind all those stone-carved vegetables. Greet all FOUR of the keys to this kingdom. You know who they are. Breakdown Road Blue door Behind the Odyssey An alternate version of Breakdown Road in the Wooded Kingdom where Mario cannot use Cappy. Invisible Road Blue door On a lower ledge directly beneath the binoculars An alternate version of Invisible Road in the Wooded Kingdom where Mario cannot use Cappy to clear off the poison spat out by the Poison Piranha Plants or to help him defeat them. Vanishing Road Blue door At the middle island's northeastern corner An alternate version of Vanishing Road in the Metro Kingdom where Mario cannot use the Motor Scooter or Cappy. This area also doesn't contain any Coin Rings. Siege Area Moon Pipe Next to the door leading to Invisible Road An alternate version of the Siege Area in the Metro Kingdom where Mario must capture Yoshi and help him eat all the berries to obtain both Power Moons. The Sinking Island Moon Pipe On a narrow ledge below the cliff just north of Hint Toad An alternate version of the Sinking Island in the Seaside Kingdom where Mario must capture Yoshi and help him eat all the berries to obtain both Power Moons. The Magma Swamp Moon Pipe At the middle island's southmost end An alternate version of the Magma Swamp in the Luncheon Kingdom where Mario must capture Yoshi and help him eat all the berries to obtain both Power Moons. Arrival at Rabbit Ridge! : The goal is to defeat the Broodals and RoboBrood on Rabbit Ridge Tower and collect the Multi Moon. The Dark Side has yellow Power Moons. There are a total of 26 Power Moons (23 regular Power Moons and 1 Multi Moon) on the Dark Side. When the player first visits this kingdom, they can only collect 2 Power Moons, including the Multi Moon that is collected from defeating the Broodals for the last time. After they defeat them, 12 more Power Moons which are more difficult versions of previous challenges found throughout the other kingdoms will be unlocked as well as 10 pieces of Hint Art. There are no Moon Rocks to break for Power Moons in this kingdom. Dutch Schaduwkant Shadow Side, this is the Dutch term for the moon's dark side. 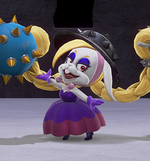 Dark Side, and that fact that the Broodals hail from the Moon, is likely a homage to the Japanese, folkloric belief that a rabbit lives on the moon. Despite the fact that Madame Broode rules over the Rabbit Ridge, she is never seen here. Rosalina makes a cameo appearance as an 8-bit sprite behind one of the statues outside Rabbit Ridge Tower. Along with the Cap Kingdom, this kingdom is the only kingdom to contain no 8-bit segments.